Gorgeous 5 Bedroom w/ Electric Cart, 2 Community Pools, Tennis Courts & Private Beach Access in The Preserve at Grayton Beach! 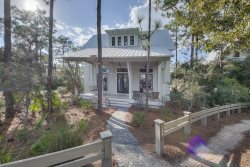 ‘All Is Grayt’ is a 5-bedroom home in the gated community of The Preserve at Grayton Beach. At 3,347 square feet, this luxurious completely custom home leaves no detail overlooked. Upon entering the home, one is warmly greeted by a tall foyer and small office nook. The designer kitchen boasts Jenn Aire Pro Stainless appliances, white quartz countertops and custom cabinetry in addition to the eye-catching barn wood door ceiling holding three chic oversized pendants above the eat-in kitchen island that seats six. Ideal for entertaining and savoring meals with those you enjoy, two beautiful distressed dining tables seating twelve in linen chairs and oblong upholstered bench are located adjacent of the kitchen. The grand living space is open and airy, bright blue hues with white cream undertones flow throughout. Ample seating is available on the cream linen couches and accent stools surrounding the elegant gas fireplace and large flat screen tv hoisted above. Just out the doors you will find a boasting screened porch with four rockers encircling an additional gas fireplace - a perfect spot to enjoy your morning coffee or catch up with friends on cool evenings. The main floor of the home is also the host for the master suite; a gorgeous king bed with a private bath featuring an exquisite oversized walk-in shower and soaking tub. Additionally, on the main floor is a half bathroom and laundry room. Moving up the staircase to the second floor, an additional living space filled with cool, costal colors features a flat screen television, seats for four, a wet bar and balcony access creates a serene area to relax. Just off the second living area are two additional king suites both featuring private bathrooms with walk-in showers. A queen bedroom with a private bathroom and walk-in shower is also located across the hall. The fifth bedroom of the home is a charming bunk room with two twin over twin built in bunk beds with one affixed trundle bed, sleeping a total of five, and private bathroom hosting a tub/shower combination. While staying at “All is Grayt” located in The Preserve of Grayton Beach, you will have full access to two community swimming pools, private beach access, tennis courts, clubhouse with workout and ping pong room. Lined with artsy villages, coastal lakes, upscale resorts, eclectic beach bars, world-class restaurants and 25,000 acres of protected habitats, Florida's Scenic Highway 30-A has something for everyone and is home to the world's most beautiful white sand beaches.